Knocklyon Florists has been trading in Dublin 16 for 26 years. We stock a wide range of quality flowers and plants and deliver to most areas of Dublin. 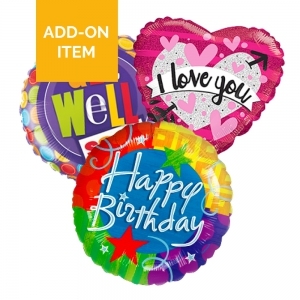 We offer great contemporary style, from bouquets and arrangements, chocolates, balloons and soft toys, to quality and elegant sympathy flowers. Our aim is a superbly efficient high quality service. Same day delivery on most orders received by 2pm. Beautiful bouquet. Matched the online photo. Delivered by a very nice gentleman. Really pleased with the service. Ordered Monday morning in Australia (my time) and were delivered same day to my mam in Terenure. She was delighted so I'm a very happy and impressed customer. Will definitely use again. Beautiful arrangement and finished arrangement wasnt far off the website image. 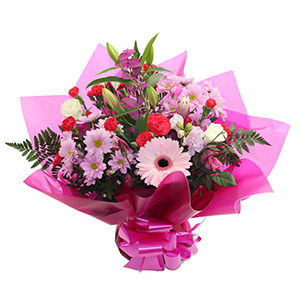 Super florist with a good range of in season fresh blooms and lovely arrangements. Friendly helpful staff and well priced product. The flowers never arrived. They were for a funeral and too late now. <br/> <br/> I would request a refund please. My chosen flower supplier was changed. A little disappointing but ok in the end. My 1st choice from now on when I need flowers sending to Dublin, great Florist with an excellent service! The flowers are simply gorgeous, fresh and beautiful. The sister was very pleased and said that she admired the flowers every day. Thank you very much for the excellent service. Thank you, you did as I requested, brilliant! Luxury looking flower arrangement, quick delivery, recipient delighted. Absolutely amazing service. Would use again if needed. Excellent service from KnockLyon Florist, Dublin; recipient was thrilled with the bouquet. Great looking flowers and display, my mother is absolutely thrilled . Delivered on time as expected. Thank you ! I asked specifically for Lily&rsquo;s and did not get them. It was an expensive bouquet and the it looked cheap when delivered. The bouquet of flowers was beautiful and delivered early on Saturday morning. My mother was very pleased. Thank you. Lovely flowers, great service even at such short notice. The flowers were incredible! Big, Beautiful and spot on with the colors that I requested. Delivery the day that I ordered and the delivery person was awesome. Overall great Florist and organization. The flowers were delivered exactly when Irequested and the recipient was delighted. The word 'gorgeous ' was used by more than one person. Thank you for helping make this person's birthday special. Original florist could not fulfill the order so direct2florist very quickly arranged for another florist to complete the order. Flowers were delivered in accordance with the special request for timed delivery, Very happy with the service. 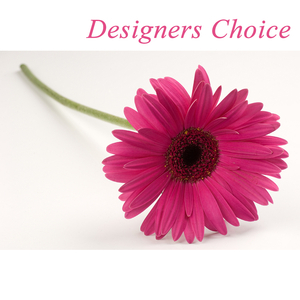 Excellent service, much better value than Interflora and a beautiful bouquet sent. Many thanks, we will be back! Very impressed by the service, the bouquet was a gift and told they were beautiful. Flowers were well liked, the cup was different than the picture and the information said it would be so. It was just a white cup. Fantastic product - very impressed! Very prompt with delivery and flowers were lovely. My sister loved the selection of flowers. There was some difficulty delivering the flowers as the recipient's return home was delayed, but it was dealt with very well and I'm told that the flowers are beautiful. ...Very nice, very fresh flowers delivered promptly by very personable delivery person. Recipients delighted. Thank you. Flowers were lovely &amp; much appreciated by recipient. Amazing arrangement with beautiful fresh flowers, and delivery with a smile to top it off. Beautiful flowers and extremely quick delivery of them. Ordered from USA and the flowers were delivered in Ireland the next day. The recipients were very pleased with the arrangement. Always easy to deal with, and the delivery person has always been extremely friendly and punctual so I am told! Beautiful flowers. 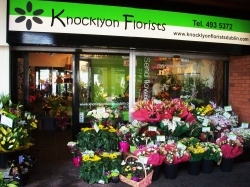 I was very satisfied sending flowers through KnockLyon Florist. I ordered flowers late last night and they were delivered by 2pm today! The person I sent flowers to thought they were beautiful and absolutely loved them! The flowers really brightened up their day. On time, great price, exactly what I wanted! Thanks! Mission Accomplished! Your customer in the US is thrilled and the recipient in Ireland is surprised and very, very pleased. Delivery completed in less than 24 hours, and in high style. Since this is the second time in a row for such great service, I don't know how you could do it any better. I am looking forward to St. Patrick's Day so I can do it again! Delivery arrived at destination, on time and was well received. Excellent service in every way. I couldn't be more pleased with the way this transaction was handled. And, the recipient was even more pleased than I am! I consider this transaction to be an overwhelming success. Thank you very much. 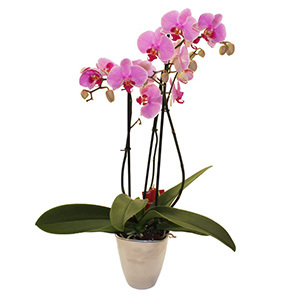 Exotic long living Orchid in pinks or whites. 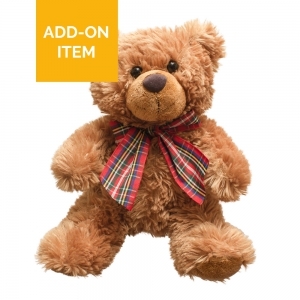 A super gift suitable for any occasion. Just add water! A classic Hand-tied prepared by your florist to delight your chosen recipient. Delivered in water! 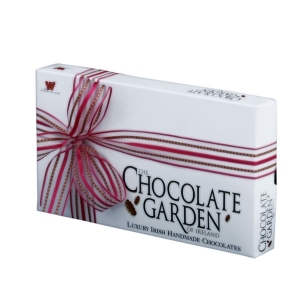 Delicious Irish hand-made chocolates from "The Chocolate Garden" near Shilelagh, Co Wicklow. Image is medium Size.